Lynn Mackey. From campaign website. Lynn Mackey, Senior Director of Educational Services for the Contra Costa County Office of Education, announced Tuesday her candidacy for Contra Costa County Superintendent of Schools in the June 2018 primary election. 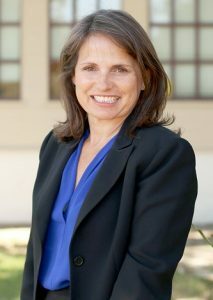 Mackey, a lifelong resident of Contra Costa County and 21-year educator/administrator, has worked closely with the Contra Costa County Superintendent of Schools for 21 years, and says that this experience is unique and will serve her well as County Superintendent. Preparing students for college, career and life, with 21st century programs and services starting with early childhood education. Promoting social emotional learning and civil discourse. Providing students with safe and supportive classrooms and schools. Recruiting and retaining the best teachers possible and providing them with the highest quality training to support them in their professional growth. Supporting each of our 18 school districts to be fiscally prudent and accountable, and to provide high quality programs and services to their students. Empowering parents and students to have a voice in the educational programs in the County. The Contra Costa County Superintendent of Schools administers all County Office of Education programs and facilitates cooperation among schools, colleges, universities, government and community organizations. She is responsible for monitoring and approving all school district budgets. In addition, she serves as an advocate for education with the legislature and the public. For more information about Lynn Mackey, visit her website at Lynnmackey.org or email her directly at Lynnforstudents@gmail.com. 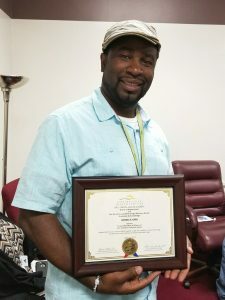 County Office of Education employee Derrick Kirk with his award plaque. Photo by CCCOE. At the July 18 Contra Costa County Board of Supervisors’meeting, Contra Costa County Office of Education (CCCOE) employee, Derrick Kirk, was honored with the 2017 People Who Make a Difference Award. Annually, the Contra Costa Alcohol and Other Drugs Advisory Board acknowledges both volunteer and non-volunteer individuals and groups that have significantly contributed towards reducing substance use in our communities. Kirk is a youth development specialist for CCCOE’s Tobacco Use Prevention Education (TUPE) program. In earning this special award, he was recognized for his work last year in training nearly 500 middle and high school students as TUPE peer educators throughout Contra Costa County. In addition, he’s co-coordinating the CourAGE Youth Health Coalition, along with the Center for Human Development’s Friday Night Live Program. CourAGE is a youth-led group that plays a countywide leadership role in addressing issues such as tobacco, alcohol, and other drug use and misuse. He continuously encourages young people to “shoot for the stars.” With the training and ongoing support from Kirk, hundreds of local students have been given the tools and the confidence to present issues associated with underage substance use to their classmates. The purpose of the TUPE program is to reduce youth tobacco use by helping students make healthful tobacco-related decisions through tobacco-specific educational instruction and activities that build knowledge as well as social skills and youth development assets. TUPE maintains a Web page for additional information. SALT LAKE CITY (Grassroots Newswire) July 24, 2017 – The following local residents have received their degree from Western Governors University (WGU). The university held its 33rd semi-annual commencement ceremony at the Salt Palace Convention Center in Salt Lake City on July 15 and celebrated the graduation of more than 10,000 graduates. At the commencement, the online, nonprofit university recognized 6,348 undergraduates and 4,140 graduates who have completed their degrees in business, information technology, K-12 teacher education, and healthcare, including nursing. Clayton M. Christensen, the Kim B. Clark Professor of Business Administration at Harvard Business School and Founder of The Christensen Institute, delivered the commencement address, and joined President Scott D. Pulsipher in honoring the more than 1,000 new alumni participating in the ceremony. Students who were not able to attend the ceremony in person were able to watch the event via live video stream on WGU’s website. WGU has made convenient and affordable higher education available to busy adults. Demand for its competency-based programs can be seen in the year-over-year growth of WGU’s national impact. Forty percent of this year’s graduates represent the first generation in their family to complete college. The average time to graduation for bachelor’s degrees was two years, three months and the average time to graduation for graduate programs was one year, eight months. Since WGU’s founding in 1997, the online, competency-based university has awarded more than 87,000 degrees; 20,000 of them in just the past year. Designed to meet the needs of working adults, WGU’s competency-based learning model makes it possible for students to fit studying into their busy lives. Students complete courses as soon as they demonstrate that they have mastered the subject matter, enabling them to move quickly through material they already know and spend more time on focusing on what they still need to learn. As a result, many students are able to accelerate their studies, finishing faster and saving money. Established in 1997 by 19 U.S. governors with a mission to expand access to high-quality, affordable higher education, online, nonprofit WGU now serves 82,000 students and 87,000 graduates in all 50 states. Driving innovation as the nation’s leading competency-based university, WGU has been recognized by the White House, state leaders, employers, and students as a model that works in postsecondary education. In just 20 years, the university has become a leading force in changing lives of through education. WGU is accredited by the Northwest Commission on Colleges and Universities, has been featured on NPR, NBC Nightly News, CNN, and in The New York Times. Learn more at www.wgu.edu. Contra Costa County Teacher of the Year finalists (left to right): Kari Stewart, Walnut Creek School District; Paula Raj, West Contra Costa Unified School District; Marissa Ware, San Ramon Valley Unified School District; Tom Trowbridge, Mt. Diablo Unified School District. Photo courtesy of Contra Costa County Office of Education. 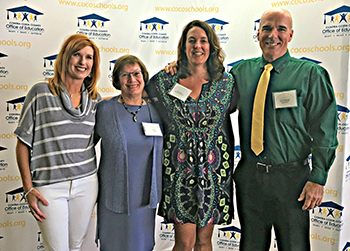 PLEASANT HILL, Calif., July 19, 2017 – It was a morning of absolute inspiration for the Contra Costa County Office of Education (CCCOE) employees and invited speech judges at the annual Contra Costa County Teacher of the Year Speech Presentation, held this morning at the CCCOE’s Stewart Building, in Pleasant Hill. Paula Raj, West Contra Costa Unified School District: Before she was old enough to attend school, Raj began honing her teaching skills with a “classroom” of stuffed animals and younger neighbor kids. Raj teaches Spanish to grades 9-12 at De Anza High School, in Richmond. The 35-year teacher has taught at De Anza for the past 21 years. Prior to her current position, the Brooklyn native taught middle and high school Spanish and French in Brooklyn, New York City, and Lexington, Massachusetts. Kari Stewart, Walnut Creek School District: While majoring in genetics, Stewart found her career in education through a college internship tutoring local at-risk students. Stewart will soon begin her 25th year of teaching for the Walnut Creek School District. For the past two years, Stewart has taught multiple subjects at Tice Creek School, in Walnut Creek. Her former experience includes teaching at the school district’s Walnut Creek Intermediate and Buena Vista Elementary, grades 5-8. Tom Trowbridge, Mt. Diablo Unified School District: Trowbridge has been a building trades and engineering educator for more than 11 years at Concord High School. His high school courses include CTE/ROP robotics engineering, civil engineering and architecture, woodworking technology, and construction technology. For the past year, Trowbridge and his students have continued to make news with the construction of their low-cost, eco-friendly Tiny Homes project. Marissa Ware, San Ramon Valley Unified School District: Ware was well on the road to becoming a physical therapist, but during her college work with an infant development program, she became fascinated watching the development stages of the infant and toddler patients grow. From this experience, Ware changed course to education. The 18-year educator has been teaching grades K-3, at John Baldwin Elementary, in Danville for the past six years. On the evening of September 28, 2017, all 22 TOYs, accompanied by their families, friends, and co-workers (an audience of close to 500) will be honored at the annual Contra Costa County Teacher of the Year Gala, held at the Hilton Concord. Contra Costa County Superintendent of Schools Karen Sakata, who serves as master of ceremonies, introduces the TOYs by sharing a special story that reflects her classroom visits of each teacher during the current spring and summer months. This will be followed by the four TOY finalists giving their speeches to the filled banquet room (same speeches that were presented today). Finally, the night will come to a dramatic close with the announcement of the two 2017-2018 Contra Costa County Teachers of the Year. The two winners of the County TOY program will represent Contra Costa County in the California State Teacher of the Year Program this coming fall. Concord City Councilman and one-time mayor Ron Leone, a former vice principal at Antioch’s Deer Valley High School, confirmed today that he is running for the position of Contra Costa County School Superintendent in the June 2018 election. Incumbent Karen Sakata, serving in her first term, has not yet indicated if she will seek re-election. Leone also mentioned the financial challenges he plans to address. Vocational training is strongly advocated by Leone. He described a Regional Occupation Program (ROP) his students used during his tenure in Fremont. 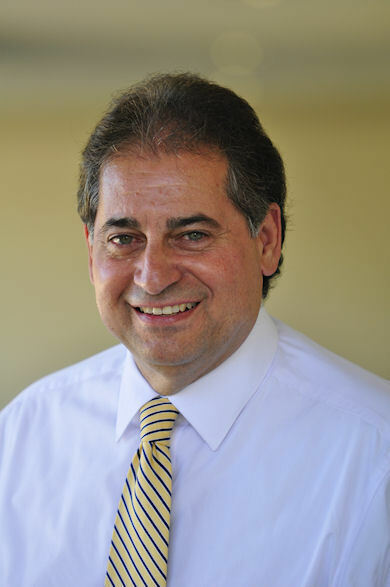 Leone wants to work closely with the local school districts in the County. As of today, he’s already met with twelve of the County’s local school district superintendents. Prior to being elected to the Concord City Council, Leone served for 16 years as an elected member of the Mt. Diablo Hospital District Board, as well as Chairman of the Board of the John Muir Hospitals, and the City’s Planning Commission. Leone invites anyone interested in learning more to contact him at RonaldLeone@comcast.net. Sacramento, CA – Gov. Jerry Brown, Monday signed AB 341 by Assemblymember Jim Frazier (D-Discovery Bay), which gives local school districts the authority to use funds at their discretion for student participation in field trips or excursions to other states, the District of Columbia, or a foreign country. The idea for AB 341 came locally from the Fairfield-Suisun School District, which is in the 11th Assembly District. In the spring of 2016, Armijo High School and Grange Middle School VEX robotics teams qualified to participate in the world competition in Kentucky. The students on these teams needed financial assistance to attend the competition. The school district was required to file for a waiver to the state Department of Education, in order to use district funds for this purpose. AB 341 will eliminate the need for a waiver, allowing school districts to use their own discretion on whether to use district funds for travel that enhances student educational experiences. Assemblymember Jim Frazier represents the 11th Assembly District, which includes the communities of Antioch, Bethel Island, Birds Landing, Brentwood, Byron, Collinsville, Discovery Bay, Fairfield, Isleton, Knightsen, Locke, Oakley, Pittsburg (partial), Rio Vista, Suisun City, Travis AFB, Vacaville and Walnut Grove. To contact him please visit his website at www.asmdc.org/frazier or call his District Offices at 707-399-3011 or 925-513-0411. Follow him on Facebook and “Like” him for updates on events and happenings in the 11th AD. 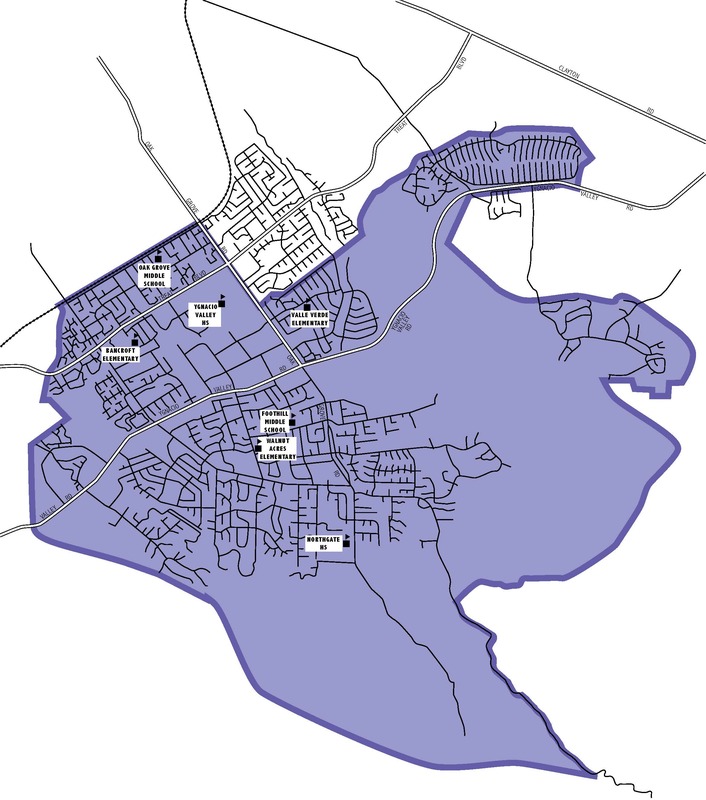 Proposed Northgate Unified District territory map. As part of the ongoing review of a petition by Northgate Community Advocacy for our Public Schools (Northgate CAPS) and its proposed transfer of territory carving out five schools to form a new school district, the Mt. Diablo School District (MDUSD) is reiterating concerns that the territory for the proposed Northgate district includes two additional schools that are physically located within the proposed district’s boundary but have separate MDUSD attendance boundaries. “The campuses of Oak Grove Middle School and Ygnacio Valley High School are clearly situated within the proposed territory for a Northgate Unified School District (NUSD) and this raises a number of issues which the Northgate CAPS organization has not addressed,” said Dr. Nellie Meyer, Superintendent of Mt. Diablo Unified. At the previous public hearings conducted by the Contra Costa County Board of Education in its capacity as the County Committee on School District Reorganization, public testimony was provided to make clear the proposed NUSD boundaries would also include attendance areas for Highlands Elementary, impacting 53% of that school’s current student body and prompting associated staff reductions and program changes or losses. The proposed division results in a new school district that is far more racially and socioeconomically segregated, depriving students in both districts of an integrated educational experience. The proposed division results in an inequitable distribution of assets and assessed property values. The proposed division separates communities and would result in increased negative traffic impacts community-wide. The proposed division would reduce the size of both districts, resulting in the disruptive shuffling of teaching and staff assignments, including likely necessitating layoffs and the elimination of key District programs. The proposed division has a negative impact on both potential districts’ financial health and educational programs. The District has made great strides over the last few years that are now paying dividends in student achievement, teacher recruitment and retention, and the provision of innovative educational programs and opportunities for every student throughout the District. This petition would derail this progress and negatively impact the District’s students, families, teachers and staff. The County Committee will have the remainder of the summer to review the Northgate CAPS petition to determine whether it meets the state’s required criteria. Additional hearings – potential leading to a recommendation to approve or disapprove the petition – are expected to take place in early fall. o Dissolving two or more existing school districts of the same kind and forming one or more new school districts of that same kind from the entire territory of the original districts. o Forming one or more new school districts of the same kind from all or parts of one or more existing school districts of that same kind. o Unifying school districts, including the consolidation of all or part of one or more high school districts with all or part of one or more component school districts into one or more new unified school districts. o Deunifying a school district, including the conversion of all or part of a unified school district into one or more new high school districts, each with two or more new component districts. · An action to transfer territory, including the transfer of all or part of an existing school district to another existing school district. (a) Within 120 days of the commencement of the first public hearing on the petition, the county committee shall recommend approval or disapproval of a petition to form one or more new districts or for the division of the entire territory of a school district into two or more new or acquiring districts, as the petition may be augmented, or shall approve or disapprove a petition for the transfer of territory, as the petition may be augmented. On or after January 1, 1981, a school district shall not be formed or reorganized to include territory which is separated from other portions of the territory of the district by the territory of one or more other school districts. 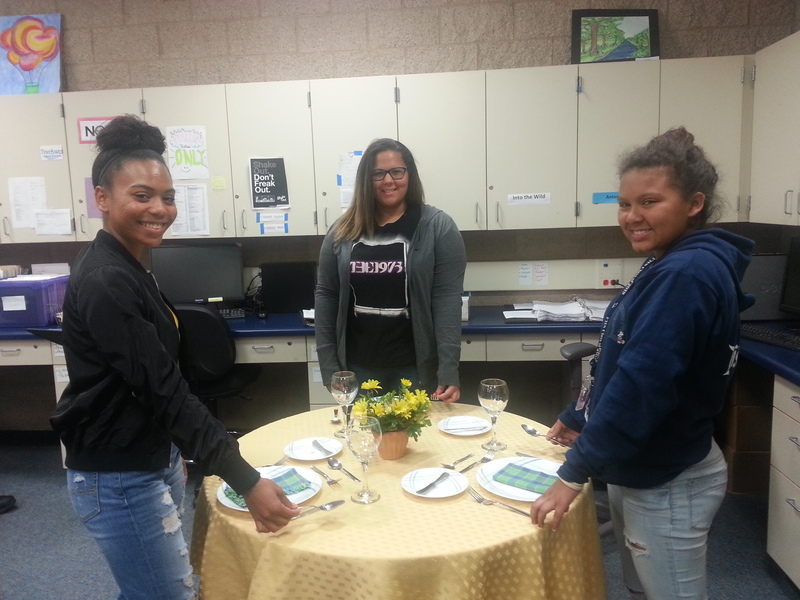 Freedom High students in the etiquette class learn how to properly set a table. Monday, May 8, marked the beginning of National Etiquette Week. More than just a list of manners, proper etiquette allows people to know how to handle themselves in life’s important interactions. How should you conduct yourself at a job interview? How about at a formal dinner? Do you know how to make a good first impression? Are you able to make a public presentation? These are just a few of the questions that are answered in classes taught by Mrs. Tina Hayes, author of Getting Ahead with Etiquette and the owner and founder of the School of Etiquette and Decorum. Etiquette class students learn to properly greet each other. 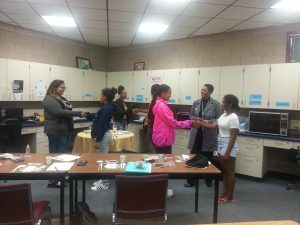 Hayes has been offering etiquette classes throughout the Bay Area and beyond over the last decade. Over the years, her classes have helped hundreds of people, both young and old, learn to be more confident and courteous, and to exhibit social graces. The training sessions conducted by Hayes and her staff cover more than 80 topics, and can be presented as workshops, seminars, or even in personal coaching sessions. Her students, and their parents, agree. My son, Eddy Crowder, an 8th grader at Paideia Academy, has attended four etiquette classes during his Junior High years. This summer, from June 26 through 30, the School of Etiquette and Decorum will be offering a Summer Etiquette Day Camp from 5:00 to 7:00 p.m. at the Lone Tree Golf and Event Center. Two sessions will run concurrently, one for children (ages 6 – 12) and the other for teens (ages 13 – 17). To learn more about these classes, or other offerings, contact Mrs. Tina Hayes at 925-519-0354 or visit the website at etiquetteschool.us. At their board meeting held on Wednesday, April 12, 2017, the West Contra Costa Unified School District (WCCUSD, or District) Board approved a petition from Voices College-Bound Language Academies (Voices, Petitioners) to open a charter school in the District with a dual-immersion program on a 4-1 vote. Due to the number of parents with children in attendance at their meeting in support of the petition, discussion was moved to an earlier time on the agenda. Dr. Linda Delgado, WCCUSD Charter Oversight, reported on staff’s review of the Voices petition based on a data review and staff rubric findings focused on six possible reasons for denial. Delgado reported that petitioners offered an unsound educational program, that Petitioners were demonstrably unable to implement the program and that Petitioners did not provide a reasonably comprehensive description of all required elements. Specifically, she said staff believed the ratio of English only to Spanish only speakers was problematic, details about curriculum and teaching methods were inadequate, and that there was concern about whether Voices would draw Special Education resources away from the District. She also said that the proposal called for teachers and staff to be paid significantly less than WCCUSD personnel, and that the proposal failed to address standards for suspensions and expulsions. Public comments followed Dr. Delgado’s presentation. About a dozen speakers, mostly Hispanic mothers, spoke in favor of the petition. Nobody spoke in opposition. One speaker said, “I am a mother who wants the best for my child,” then pleaded for approval to provide an opportunity for her child that she did not have. WCCUSD board members asked questions and commented on the petition and the review process. Board Member Tom Panas asked a series of questions involving staff concerns, remarking, “We respect our staff, at the same time, we want to make sure we’re all agreeing on the facts.” His questions revealed several discrepancies between the staff assessment and Voices explanations of their program, including a rebuttal to the staff report that Voices had submitted. Responding to Panas’ questions, Voices spokesperson Frances Teso stated that the one year their other schools had had suspensions, the number suspended was less than 1%, and that expulsions were 0%. She also said that special education staff and providers would be based locally, and that special needs students were fully included in classrooms, while there was, “no reason to believe” that the proposed school would not participate in the same SELPA that other Voices schools participated in. With respect to teacher pay, Teso said, “In any given step, we pay $2000 to $5000 more than the District pays the teachers here in West Contra Costa County.” She went on to describe the benefits package offered to teachers by Voices, along with bonuses, above salary, that their teachers were eligible for. Board Clerk Valerie Cuevas expressed concern about the District meeting the needs of students. “When I hear parents come and speak, what I’m hearing at the heart of it is, ‘you’re not serving us, so I have to go find an alternative.” She went on to say that, “Our programs must be failing our students and our parents, because they’re seeking alternatives. The data’s clear that they’re [Voices] outperforming the District…]. She emphasized the need for the District to stop making excuses about why things couldn’t be done, and start working to improve student outcomes. Following discussion, the board voted 4-1 to approve the Voices petition for a full five-year term. Board member Phillips, who had advocated for an approval time of three years, was the lone dissenting vote. WASHINGTON (April 18, 2017) – C‑SPAN and Comcast will visit Gale Ranch Middle School in San Ramon, on Wednesday, April 19 to honor a local winner for C‑SPAN’s annual student video documentary competition, StudentCam. During the visit a C‑SPAN representative will present a StudentCam certificate of merit to Sanjana Ranganathan during a ceremony in front of classmates, teachers and family members to recognize her winning achievement in the national competition and an Honorable Mention prize of $250. The winning video will also be viewed during the congratulatory event. StudentCam encourages middle and high school students to think critically about issues that affect our communities and nation. This year, students were asked to create a 5-7 minute video documentary about the topic, “Your Message to Washington: What is the most urgent issue for the new president and Congress to address in 2017?” In response, C‑SPAN received 2,903 video submissions from over 5,600 students in 46 states and Washington, D.C. 150 student and 53 teacher prizes were awarded, totaling $100,000 in prize money. Visit www.studentcam.org to watch all the winning videos for 2017. “Comcast is honored to partner with C-SPAN on their annual documentary contest, StudentCam, and are happy to congratulate local winner, Sanjana Ranganathan . These next generation documentary filmmakers tackled an issue that was important to them, their community and our nation after a historic election year. Education is important to Comcast, and we applaud C-SPAN as they continue to offer educational opportunities to young leaders to voice their opinions,” said John Gauder, Regional Vice President of Comcast California. In San Ramon, C‑SPAN programming is provided by Comcast on channel 22, 29; C‑SPAN2 on channel 109; and C‑SPAN3 on channel 110 as a commercial-free public service. All funding for C‑SPAN operations is provided by local TV providers. Created by the cable TV industry and now in nearly 100 million TV households, C‑SPAN programs three public affairs television networks in both SD and HD; C‑SPAN Radio, heard in Washington, D.C, at 90.1 FM and available as an App (Android, iPhone, Blackberry); and a video-rich website offering live coverage of government events and access to the vast archive of C‑SPAN programming. Visit http://www.c‑span.org/. Visit http://www.c‑span.org for coverage and schedules; like us on Facebook/cspan and follow @cspan on Twitter. C‑SPAN Classroom is a free membership service dedicated to supporting educators’ use of C‑SPAN programming and websites in their classes or for research. Members of C‑SPAN Classroom may access free Timely Teachable Videos and video clips for use in the classroom, as well as lesson plans, handouts and ways to connect with other C‑SPAN Classroom members. C‑SPAN Classroom has reached more than 1 million students since its inception in 1987. For more information on C‑SPAN Classroom, visit: http://www.c‑spanclassroom.org/, or follow us on twitter: @CSPAN_Classroom.